Head over to there to see my new posts. All my old posts will still be accessible here and any pins for Pinterest you may have pinned will still work. My RSS feed also transferred over so you should see no difference there either! I have known the benefits of egg shells and been saving my egg shells for a while now. People when they come to my house wonder why I have the glass jar filled with egg shells and I am always left to explain to them why it is a good idea. We use a lot of eggs in our house and we have a compost heap as well as lots of plants. So in an effort to get the most out of my scraps I knew I had to save my egg shells. Since I get asked so many times why save your egg shell? I figured I should research it more and share it with you here. Why should you put egg shells in your garden? Egg shells are very rich in calcium and all plants need calcium to grow. Some plants deplete calcium faster than others. Heavy rain and over watering can also wash away calcium from the soil making it more essential for you to replace. How should I prepare and store my egg shells? 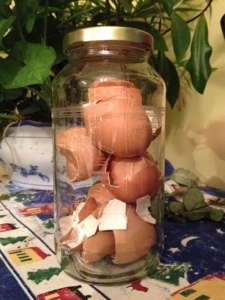 I keep my egg shells in a glass jar so they can dry out (do not put dirty or wet with egg yolk shells in the garden). Crush up the egg shells into tiny pieces. The smaller the pieces the easier it will be for it to breakdown and get the calcium into the soil. You can put the egg shells in the bottom of a planter this will help get the nutrients into the soil and right to roots. It will also help with drainage. You can also place the crushed egg shells in the bottom of a hole when you plant your flowers or vegetables or place around the stems of the plants. Are there particular plants they work well with? I have read that they work particularly well for peppers, tomatoes (helps prevent blossom end rot), broccoli, and cabbage. They also help deter slugs and cutworms (if you have a slug issue you can also put small saucers of beer in the garden, they will be attracted to that and no eat you plants). What if I just want to compost them? Make sure they are dry before you put them in your compost heap or bin. You can put them in as a larger pieces because your compost will work at a different rate. I recommend that your compost be well balanced and rich in many nutrients so even if you use your egg shells in your planters and around your plants put some in your compost as well. Do you know any other plants that egg shells work well with? Get these tips sent directly to your email inbox!